Churches, shrines, mosques, temples and other places of worship have tremendous variations in occupancy. High occupancy seldom occurs more than a few hours a week in the main assembly area. There may also be significant occasional use during the week for group meetings, daycare, weddings, and funerals. The overall electrical profile of places of worship will vary significantly depending on the non-worship related activities associated with the facility. Some of these facilities only have one scheduled activity per week - the service, while others have daycare, K through 12 schools and even meetings throughout the week. The resulting hours of operation will dictate much of the design, both technically and cost justification. A major problem is usually arriving at an architecturally acceptable integration of the HVAC system, particularly the air diffuser locations. Some individual control is helpful for the altar, sacristy and choir areas. With occupants usually seated, cold floors should be avoided. Other church areas are usually used for education, meetings, and daycare, and these are treated separately. The diversity of the total HVAC load needs should be evaluated to take full advantage of the buildings characteristics and use. Thermal storage systems are often cost-effective to reduce the size and cost of the main cooling system. Unitary air-cooled systems are typically used, often slab-mounted as roofs are not usually flat and the equipment would be unsightly. 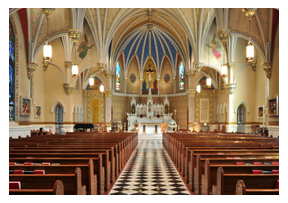 Separate units are suggested for the other church areas that are used at times other than the main services. Outdoor air damper control during system shutdown when not in use. Water-loop heat pump systems may also conserve energy if the building has significant interior zones. Some of these designs combine thermal storage where excess heat generated during the day is stored and used for heating at night. Where demand and/or on-peak energy costs are high, investigate thermal storage. The addition of heat pipes and/or desiccants in climates with high humidity. Energy conservation concepts discussed above not in use, or antiquated or inappropriate control systems all represent energy service opportunities. Water heating is not a major energy user with uses typically for hand washing and cleaning purposes. Most water heating is done separately from the building heating system using direct resistance or gas heaters, and in some cases, point-of-use heaters. Where kitchens are incorporated in the facility provision must be made in sizing the system to accommodate food preparation and dishwashing needs. If existing systems are inefficient or inadequate, replace with modern efficient equipment. Point of use water heaters for all bathrooms should be considered. If a source of waste heat (i.e. tower water) is available, consider a water-to-water heat pump heater. Lighting applications for the main worship areas of churches, synagogues, and mosques can add to the services and may be part of the architectural design. The congregation and worship leaders need adequate lighting for reading, approximately 20 to 50 FC. IES does not specify lighting levels for main worship areas. Accent lighting should be three times higher on the vertical plane. Any architectural lighting should be 25% or less of that in the seating area. Of course, higher levels are appropriate for television cameras. Choose incandescent or fluorescent sources with color temperatures of 2700 to 3500 K and a CRI of at least 70. The most appropriate type of fixture will be highly dependent on the building's structure. For example, a very large space with lower ceilings over the seating may need recessed incandescent downlights. A high ceiling in a Gothic setting will call for suspended decorative incandescent fixtures over the seating. Daylighting may also affect the lighting design and should be used when possible. Use halogen fixtures for efficiency and long life since the location of many of these fixtures will probably be in hard to reach locations. Accent fixtures such as track lighting or downlights can highlight the speaker, religious objects or other points of interest. Use architectural lighting to contribute to the general ceiling lighting and for wall washing. This will enhance the ornate features, and highlight arches or trusses. Indirect fluorescent fixtures or strategically located halogen spotlights may be appropriate. Controls will allow the flexibility to change the appearance of the worship space. Use combination switching, time clocks, dimmers or sensors to achieve this flexibility. Where kitchens are incorporated in the facility provision must be made for food storage.